An original block print design by Methow Valley sixth grade student Dalton Evans will be featured on t-shirts commemorating the 2018 Methow Kids’ Free Fishing Day, which is part of National Fishing and Boating Week. Additional designs were chosen to be featured on posters that will be hung throughout the valley. The additional artwork features the following sixth grade students: Sterling Konrad, Amelia Evans, Leki Albright, Penny Palinska, Birch Marcus, Brody Barnhart, Dashe McCabe, Ayla Belsby and Lilian Overbeck. The annual event is on Saturday, June 9 at the Winthrop Fish Hatchery from 10am-2pm. The Fishing Day theme — CRITTERS IN THE RIVERS — celebrates the vital role that clean, accessible water plays in sustaining life across ecosystems. 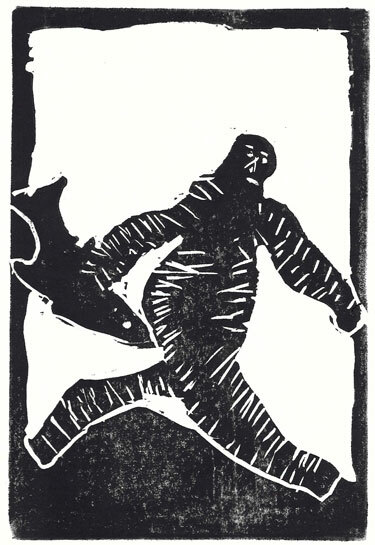 The block prints were created through a Methow Arts Education Class: an interdisciplinary unit on Methow fish and fish habitat offered to sixth graders in conjunction with National Fishing and Boating Week. In this interdisciplinary unit students first learned about fish and fish habitat in a workshop in their classrooms with local biologist John Crandall. They then sketched images and learned how to carve blocks and print them with local teaching artists Laura Gunnip and Emily Post, with help from artist Jennifer Molesworth. The block prints feature fish, mammals, and habitat of the Methow Valley Watershed. The project was sponsored by the US Bureau of Reclamation.